I am very excited to see how ScaleIO or also known as ViPR Block will be developing from now on. I had the opportunity to touch and test it at EMC vLabs and get closer to its architecture and the way how to manage storage resources. I was nicely impressed by its capabilities. I’ve posted a note 6 months ago stating that we could be facing a possible new generation of storage technology. I have mentioned Nutanix as an example of this, the reality of a converged infrastructure that simplify data management architectures. However, I was wondering by ending this very note, “Why does Nutanix need the appliance?”. I thought if It would not better to just sell the software and leave the customer take his/her own decision about what hardware wants to use. Hardware is being so irrelevant today. We can say most the storage’s vendors turned out into software’s vendors. They use almost the same hardware components as any server. The only difference is they turn them into an appliance and ensemble a beautiful face of plastic and neon lights on it. The advantages of any products came directly from its software functionalities. Software makes a big difference for any customer in their business. Software enables them to react faster against the adversity or speed strategic actions. Software helps them to reduce operation costs and keep their operation online beside any failure or disaster. Software can change the way to do business with any company or get advantage over any competitor. Back to ScaleIO or now called ViPR Block, I think It was the smartest move that EMC could make after some years. 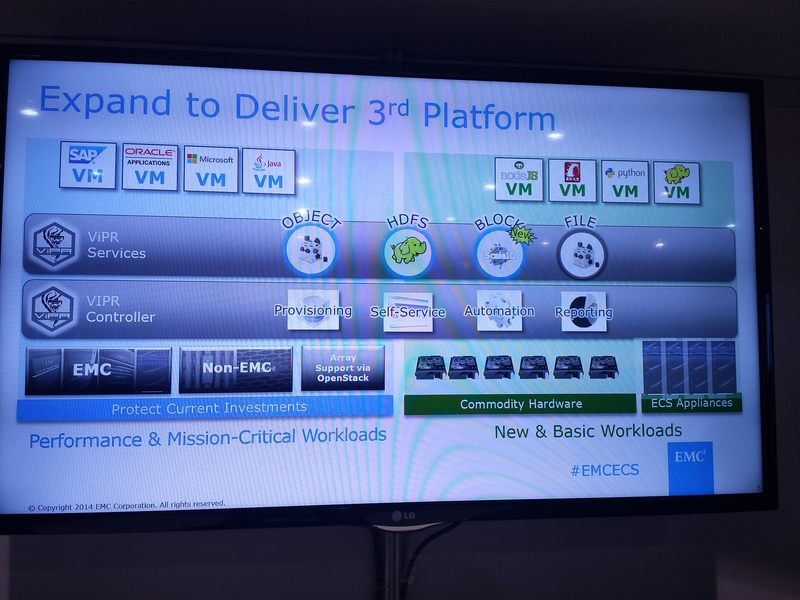 The first time that I’ve heard about ViPR, It came to my mind firstly another try of EMC to virtualize their competitor’s storage arrays and turn them out into a bunch of disks and outshine their more competitive advantages. Also, I didn’t personally pay a closer attention to these technologies and its features to manage data and devices and EMC didn’t make a big effort either to highlight their main benefits as they have done it this year. ViPR used to aim mostly file or object storage needs, HDFS – Hadoop, Big Data- requirements also could be covered through the same solution. We’ve been working with a solid OpenStack Swift to provide object storage – I don’t see any gain to use file storage at the cloud yet – and HaDoop on OpenStack to speed any HDFS provisioning to our customer; then you are figuring out that I didn’t see any help to replace our storage solution with ViPR and pay its license cost when we didn’t need it. At this point, ScaleIO made my head to roll with a lot of ideas, such as how to get more advantage from it to strengthen our cloud portfolio and being more competitive. Below you can see a slide that simplify the reasons why it is important to pay a attention to products like these. Select the option that fits better with you. 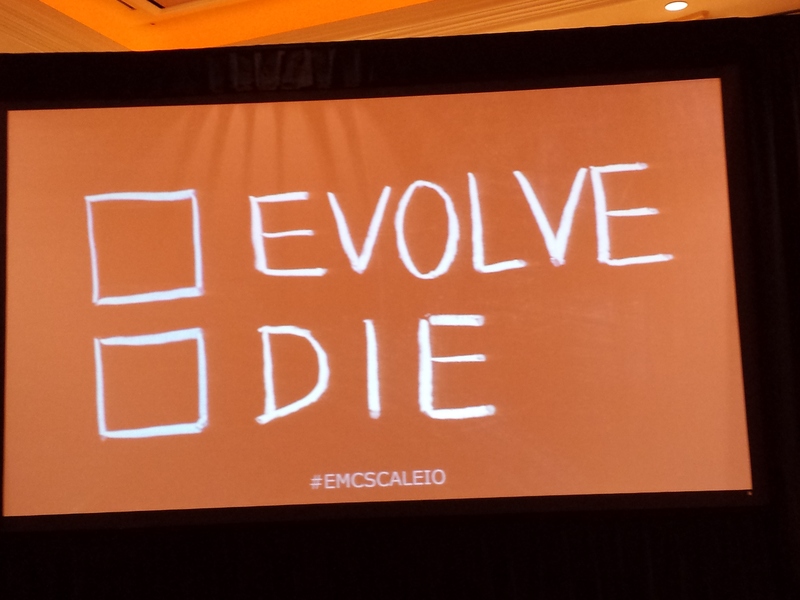 I got this picture from the presentation made by Ed Beauvais at #EMCWorld14. Meta Data Servers (MDM): Consider at least three servers for redundancy and it will be used to monitor the all systems. ScaleIO Data Server (SDS): It will be used to share the local storage devices of every server. 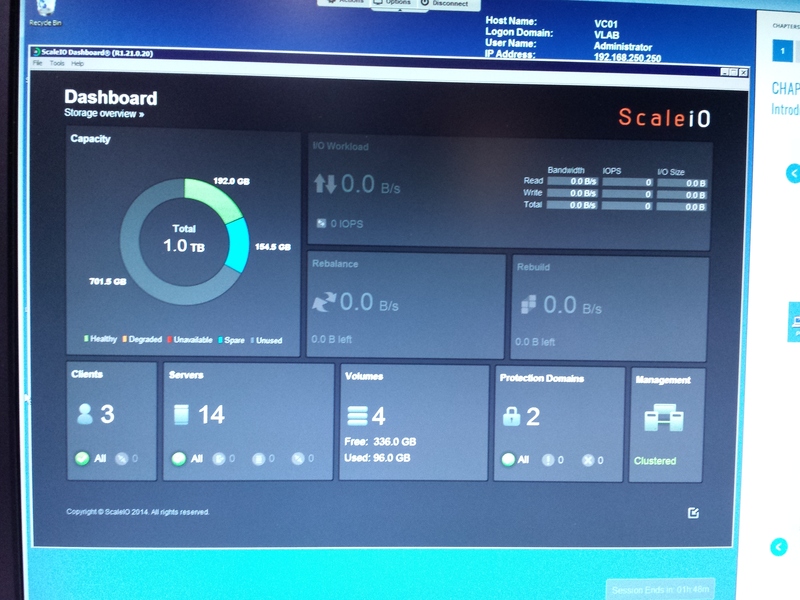 ScaleIO brings a Dashboard that a allows you to get a fast glance of errors and operation metrics. You have to do all the changes in the ecosystem via command-line. You can remove SDS without impacting the data access availability and the system start to re-balance the rest of SDSs. This immediate adaptation to the changes help you to lower costs and impact to decommission hardware components over the time. It also gives you all the warranties, that the performance will be the best possible. You can control how much bandwidth or IOPS could use a rebalance process for not impacting the system meanwhile it is recovering the entropy. You can get SnapShots and turn these SnapShots into volumes. Also, you can create consistency groups copies through SnapShots among different volumes. SnapShots don’t have an impact in performance, they are not “copy on write”, ScaleIO change pointers instead copying data blocks. Then, you can use a nice data protection solution to speed restore against any logic failure or human mistake – 80% of the cases or data failures -. I had the opportunity to get direct contact with two current ScaleIO customer during #EMCWorld14. Ruben van der Zwan, CTO at Amsio, who explains to us why his company decided to move his Cloud Services’s Storage Infrastructure to ScaleIO. He also gave reasons about why he has defined an architecture of two layers – they have split SDC and SDS into different servers – Main reasons? Performance and Cost. Also, ScaleIO can be automated through APIs as well. IMHO the only downside today is the limited amount of snapshots supported by the overall system. Maybe EMC could consider to extend it in the short term. Now, you have to play with conventional backup solutions for a while. Finally, I was glad to be at #EMCWorld and see how trends about storage technologies are changing. see you to next note. 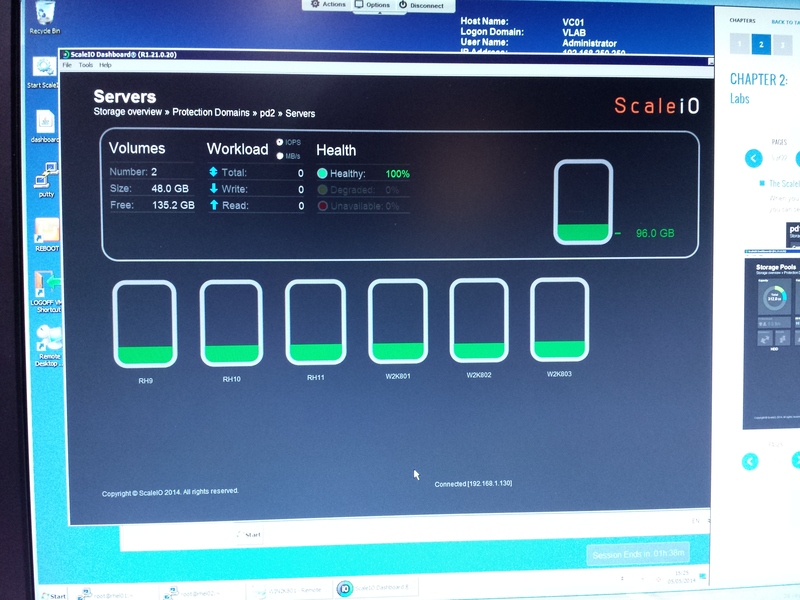 Excellent write-up on ScaleIO and ViPR. Excited to see others “getting it”.